Blogs, like online discussion forums, are a wonderful beast. Your horizons expand beyond your physical vicinity and you make new friends of every color and creed. Most remain online or virtual friends. Some, we have the pleasure to meet in person. And so it happened to me, yet again. I made a new friend, this time through my blog, and I had the pleasure of meeting up with her over lunch last week. She was everything and more than I thought she would be. We are planning to meet often and get up to some girl-fun together. Yay!! Good things happening to me always make me long for something sweet. Something milky. Something spongy. Something quick and easy. Can't be Ras malai? Hygiene tip:Wash your hands really well in hot water cos you're going to be handling the food and it's not going to be cooked once you're done playing with it. Alternately, use sterile food gloves. Empty milk into your dessert bowl. Take a rasgulla and squeeze as much sugar syrup out from it as possible without letting the rasgulla crumble. 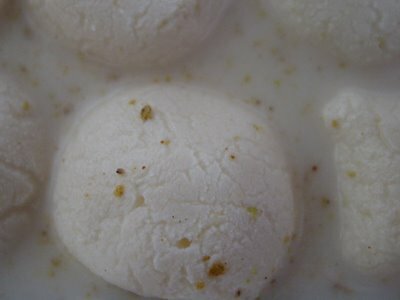 Dunk the squished rasgulla completely in the milk and hold for a couple of seconds and then release slowly, allowing the rasgulla to assume it's original shape and size. As it does this, it absorbs the milk into every spongy air-pocket. Repeat this for each rasgulla until you have all the rasgullas floating in a bed of milk and perhaps, a couple that didn't make it to your dessert bowl, settling comfortably in your tummy. Add 6-8 tablespoons of the sugar syrup to the milk and mix well. Taste it and adjust the sweetness to your please your sweet tooth. Lightly toast the pistachios and almonds. Allow to cool and then pound or grind into a coarse powder. Mix the cardamom powder with the powdered nuts and garnish the rasmalai. Chill for an hour, if you have the patience, or eat right away! I usually maintain a stock of couple of tins of Haldiram's rasgulla's. This ras malai takes all of 10 minutes to put together. There is no need to soak the rasgullas in milk overnight to get that ras malai kind of taste. I've made this as late as a few minutes before my guests arrived. And it never fails to enthrall or please. Furthermore, it's a task that can be allocated to the ever faithful, devoted and helpful husband, as it's something that is really difficult to mess up. Even kids can partake in making this dessert. - AF's recipe that uses ricotta cheese. Where are you these days, AF? If you're like me - never have enough hours in the day - dunking is the answer! I am like you :-) Give me dunking anyday. When I saw the recipe I went "aah....why didnt I ever think of this?". Lemme try this sometime. And you are so lucky to get to meet a fellow blogger! Yummy...Love the photos-I am printing out your recipe and making me some rasmalaiyummm. Ashwini, when I first looked at Haldiram's rasgullas, I didn't find them particularly inspiring. In any case, in my mind, nothing can compare with the rasgullas made by Brijwasi's (near Khar (W) station, Bombay). Haldiram's canned rasgullas are small and 'hard' but they undergo a transformation when dunked in milk, after squeezing all that sweet syrup out. They become incredibly soft and spongy. I haven't had the time to call my aunt yet. I keep missing the window within which it's not too late or early for either of us. Hi Me! Welcome to IFR!! Try it out and let me know what you think! Hey they look really authentic! I once tried making rasmalai from scratch, and they turned out really disappointing. Maybe I found my answer. Gini, they taste more like the traditional ras malai to me than the ones made from scratch with ricotta cheese. The traditional ras malai is flatter while these are more rounded. 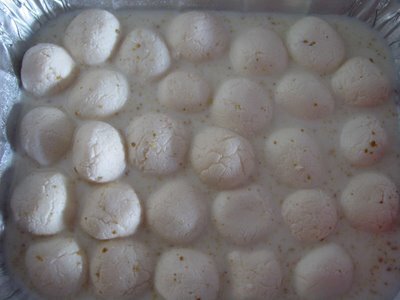 My sister used to make ras malai by starting with whole milk, making the home-made cheese, kneading it into balls and steaming them in the pressure cooker. I don't have the time to do all that and let's not even discuss the clean-up thereafter! Make 'em and enjoy 'em, Lakshmi! Hey Shyama! Gulping contest, eh?! Since there are only 14 rasgullas in each tin, I have to stop myself from doing precisely that before my guests arrive. I've seen and eaten both types of ras malai - the one with saffron and the one without (like the one I make). I prefer the 'pure' one, as you put it. Good to have you here! Shyamey, after my trip to the East Coast and the fabulous food in Manchester at Cala's, I'm getting there. :-D You think you'd ever try something like ostrich? There you go again with blood and gore! It was medium-rare but that was some sort of a delicious sauce. I loved the meat. My school-mate from Kenya tells me that ostrich farming is a big thing in Kenya as the meat is considered to be a delicacy and is in high demand in the UK, Europe and the US. And then I heard that there are ostrich ranches in the US, too. 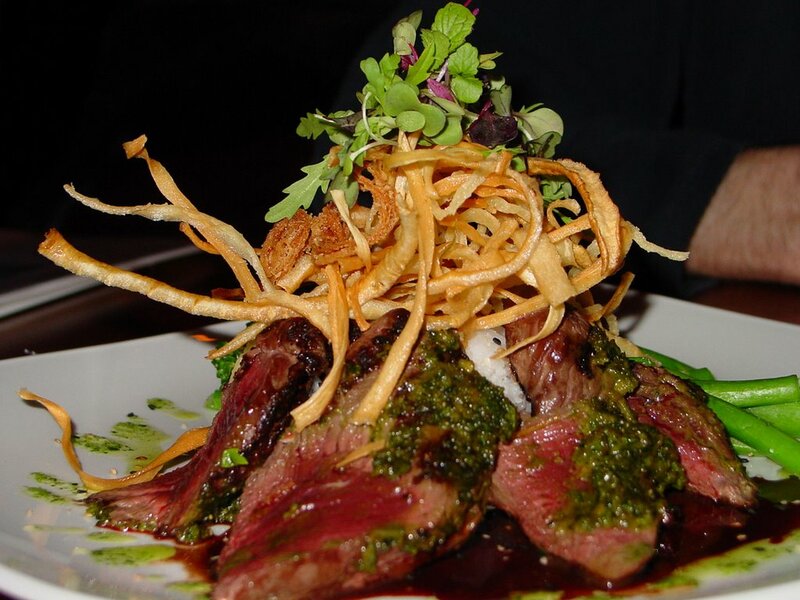 I never thought I would ever eat ostrich meat. The closest I ever got to exotic or wild meat (for me) before this was duck. I also do the same way. I have posted early march. Please take a look. Hey MT, I am sure your ras malai tastes fabulous but I don't think our methods are alike. Mine is a one-bowl, no-cook quick method that uses a simple trick: allows the spongy rasgulla to assume its normal shape and size as it is released slowly under the milk. I don't soak the rasgullas overnight or boil them in the milk, as you do. I hope that helps! My mom makes rasmalai the same way. Only she boils the milk and reduces it to half to make it thick. Rasmalai looks delish and so does the wadis. Thikha and meetha, what a lovely combo. we ship anywhere within the U.S. including alaska and hawaii. feel free to send me an email, i'd love to chat! A lady at a potluck I recently went to made this ras malai recipe. The milk syrup was really watery though. 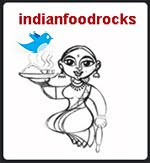 Is that the way traditional ras malai is served? I've always had the ras malai with milk the consistency of condensed milk....so I was wondering if I've only had un-authentic ones so far. Stephanie, Soma has her father's recipe for rasgullas on her blog. I haven't made them at home myself but I do have her recipe bookmarked. If you try it before I do, please do let me know how it worked for you. It is labor intensive. You could also look online for canned rasgullas. Also, please know that my recipe for ras malai is completely inauthentic as I use skim milk and barely sweeten it. Usually ras malai has milk that has been cooked down and sweetened. Some folks mix condensed milk with regular milk as a shortcut. I hope this helps!